This photo was taken last month of September. I just got a chance to post this online. 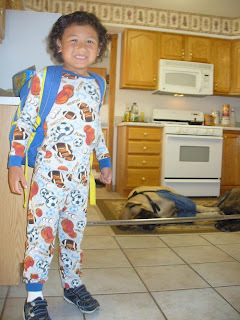 Dustin always ask me why does he need to wear pajama to go to school and I said that all the kids going to his school will wearing pajama because it is pajama day at school and the day after tomorrow it was Mismatch day so he needs to wear a mismatch clothes. He wear his favorite pajama with the football and soccer ball print on it. He was so cute!